Individuals can join an e-mail list and receive a copy of the newsletter (as a PDF file) when it is published. 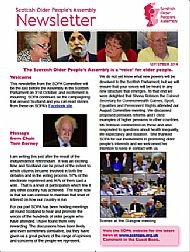 SOPA does not have individual members as it is an umbrella organisation encompassing a range of views from other bodies with an interest in improving the quality of later life. 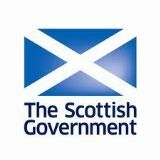 See the list of the SOPA Committee and their organisations, and the co-ordinator Glenda Watt's contact details. The newsletters are PDF files which can be enlarged on the screen to suit eyesight. Use the plus or minus buttons in Adobe Reader (which appear when the document is opened) to adjust the print size to suit. 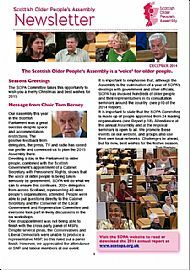 The December newsletter highlights the Assembly in the Scottish Parliament and the resulting actions. Also read about events in the pipeline for early 2015, a community project called Mealmakers and some informative links with Europe and the world! Click on image below to open September 2014 Newsletter. 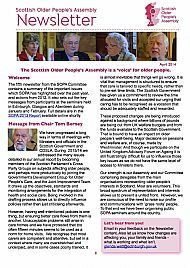 The September newsletter looks at the issues of better democracy through dialogue with the Electoral Reform Society Scotland - a very topical subject in light of the recent referendum. There is an update on the campaign trail and information about the 2014 Assembly on the 31 October. Also how to ‘age-proof’ your brain! Click here to download the July 2014 Newsletter. 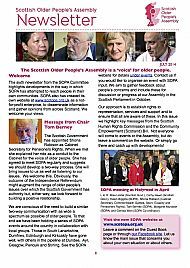 The July 2014 newsletter covers the meeting with the Scottish Minister Shona Robison, SOPA's developing role in gathering the views of older people on their home ground, human rights and their impact in care situations, the potential positive outcomes of the Community Empowerment (Scotland) Bill which is making its way through the Scottish Parliament, an update on the Assembly plans - plus much more! This issue features SOPA's key activities during 2013 to April 2014 including the outcome of the seminars.